RAH PRODUCTIONS WANTS TO TELL YOUR STORY!! WE OFFER A WIDE ARRAY OF PRODUCTION AND POST-PRODUCTION SERVICES TO MANAGE A PROJECT FROM IT'S INCEPTION TO COMPLETION, SERVING AS A CONVENIENT AND EFFICIENT "ONE STOP SHOP" FOR OUR CLIENTS. WE'RE CREATIVE STORYTELLERS USING DIGITAL-AGE TECHNOLOGY TO PRODUCE VIDEOS THAT IMPACT YOUR AUDIENCE. RAH was born in Telemundo. I worked at Telemundo for 13 years. Before working there I always had a passion and loved television production since high school, so I had the dream job! I was able to grasp the knowledge of a massive pool of professional individuals who were experts at their craft….you tend to pick up on a few things. In 2008, The Great Depression effects me. My role as Content Video Director for their website was being eliminated. I was laid off. Fast forward to 2019, RAH Productions has grown to become one of the top video production companies in the industry. OF DEDICATED WRITERS, DIRECTORS, PRODUCERS, AND CINEMATOGRAPHERS KNOW HOW TO APPROACH EACH PROJECT OF EVERY SCALE AND GENRE. FROM SINGLE-CAMERA STUDIO INTERVIEWS, TO MULTI-CAMERA COMMERCIAL SHOOTS. — Craig Nabat Founder of iRestore Freedom Laser, Inc. When I get to a location, I get into a tunnel vision mode that allows me to get the perfect shots at the perfect time. If it’s a live event….I’m all over it!! But I will keep it short. It derives from my name Raul. Back in my teen days, my friends would call me Ra and it stuck. The twist came around 1994 when I was hanging out with the most dopest Hip Hop Miami Dj’s. Dj. Chris, he branded me the name on his radio station. 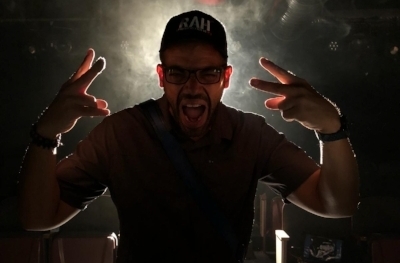 “And here we have Rah, you know… the Egyptian sun god….the god of creativity is in the studio…”. That was it. The name would carry on to my company. A video production company that creates stories in an natural, organic and artistic cinematic way, just like the Sun.